This intensive eight-day workshop is designed for photographers who have a technical base in digital photography and now want to take their skills to the next level. 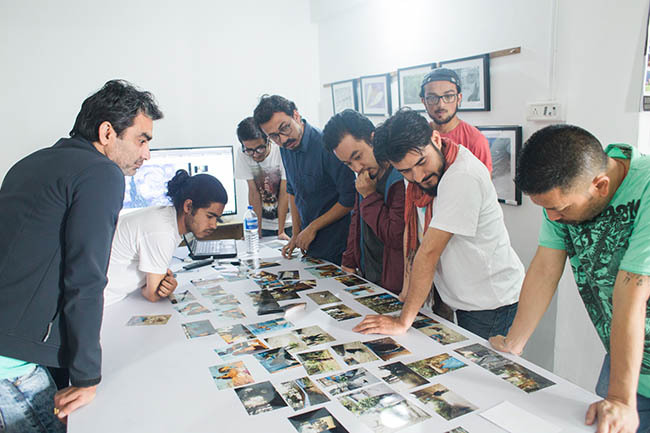 The workshop will introduce photographers to working on narratives and telling stories. Participants will be introduced to different visual styles and languages and work to produce one body of work in the duration of the workshop. Participants must be prepared to work hard and push their limits! – Participants should have a technical base in photography. – Participants should have their own DSLR cameras. – Participants should be able to commit to the workshop full time. – Participants should plan to be shooting when they are not in class. – Send us a portfolio of your 10 best images. [1000 pixels on the longest side]. Singles or story. Sagar Chhetri (b. 1990), is a documentary photographer based in Kathmandu. He is interested in socio-political stories. He graduated in the International Photography Program at the Pathshala South Asian Media Institute, Dhaka. He received a scholarship from the Danish Ministry of Education to attend a semester on Photojournalism in Danish School of media and Journalism, Aarhus, Denmark. He is currently associated with, Photo.Circle, a learning platform for Nepali photographers, Nepal Picture Library, a digital photo archive that strives to document an inclusive and alternate history of the Nepali people and Photo Kathmandu, Nepal’s only international photography festival. He is the recipient of Magnum Foundation Grant 2018. Bunu Dhungana discovered photography after leaving the world of academics and research. However, her background in sociology informs her photographic work. A graduate of JNU, Delhi, she is interested in questioning notions of gender and patriarchy. While she focuses on personal projects that center around women’s issues, she has worked within a wide range – from visual ethnography, NGO/INGO work to commercial work. She loves roaming about places, people-watching, and eavesdropping. She lives and works in Kathmandu, Nepal. Focus Kalimpong was established in 2011 to address a dire need for a group to discuss and promote photography in Kalimpong. It has since been working to promote photography through various discussion sessions, workshops, and exhibitions.